I received this book for free from Feiwel and Friends in exchange for an honest review. This does not affect my opinion of the book or the content of my review. Summer, boys, and friendships gone sour. This new series has everything that perfect beach reads are made of! Gemma just got dumped and is devastated. She finds herself back in the Hamptons for the summer—which puts her at risk of bumping into Hallie, her former best friend that she wronged five years earlier. Do people hold grudges that long? When a small case of mistaken identity causes everyone, including Hallie and her dreamy brother Josh, to think she’s someone else, Gemma decides to go along with it. Gemma's plan is working (she's finding it hard to resist Josh), but she's finding herself in embarrassing situations (how could a bathing suit fall apart like that!?). Is it coincidence or is someone trying to expose her true identity? And how will Josh react if he finds out who she is? Katie Finn hits all the right notes in this perfect beginning to a new summer series: A Broken Hearts & Revenge novel. Summer time, the Hamptons, a cute boy and a case of a mistaken identity…check. Unexpected twist ending which leaves reader in a cliffhanger…check! Fun, YA contemp that you can breeze through while on vacation…yes. Broken Hearts, Fences and Other Things to Mend kept a smile on my face almost the entire time I was reading. Gemma is sent to stay with her father for the summer while her mom and step dad are off to Scotland. But she dreads the Hamptons! Scene of a huge life changing summer that snowballed into a lot of hurt, she’s trying to avoid the place of her crime. But when she meets a cute boy on the bus and his sister comes to pick him up the cat is out of the bag…or not. Gemma is desperately hoping her nemesis Hallie won’t remember who she is, and that the name printed on her coffee cup can be her alter identity for the time being while she explores things with Josh. But things just keep getting weirder and weirder! A babysitting job turned nightmare, food poisoning, stolen shoes and a malfunctioning swimsuit are among the crazy happenings that keep Gemma on her toes. She keeps falling into such embarassing situations that publicly humiliate her, yet Josh seems to truly care. And Gemma finds herself drawn to him even though sister Hallie has warned her not to hurt him. Josh is a keeper! I loved the writing, the characters and the ultimate lesson that honesty always is the best policy. While it is somewhat predictable there is enough of a plot twist that I predict readers will be pulled in for the entire series, not just book one. I would like to feel, smell and hear more about the setting in the next books as the Hamptons are perfect for summer. 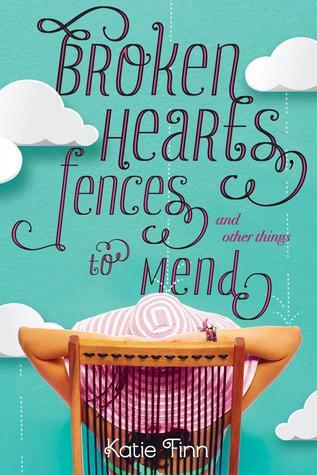 I would recommend Broken Hearts, Fences, and Other Things to Mend. Add it to your reading list! Content (highlight to reveal): one swear word, bullying. Katie Finn grew up in Connecticut, in a town that looks an awful lot like Putnam. 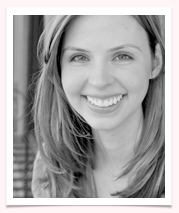 During high school, she was a total theater devotee (like Madison) and never dreamed she’d be a writer. But lots of Katie’s high school misadventures have made it into her books…which just goes to show that you never know! She currently lives in Los Angeles, California, in a house she wishes was a lot closer to the beach.